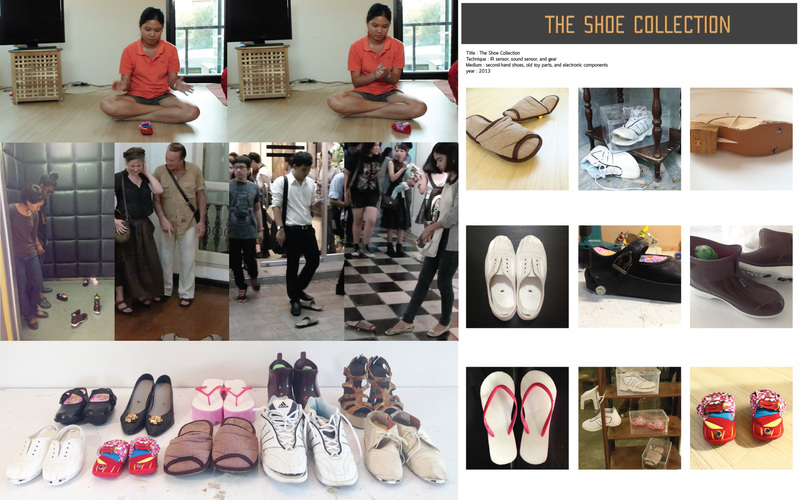 The Shoe Collection was originally an experimental project designed to study electronics and gears. Later, its mobility and responsiveness to human nature inspired further designs that embedded these features into one of the most common daily-life wearables: our shoes. Shoes are inanimate objects, yet each and every pair of our shoes has been through journeys, powered by minds and muscles of we human beings. This work took this idea a step further, imagining shoes as living entities that might move, behave, and have personalities that relate to their appearances. After working on the My Diary series, which increased my understanding of moving functions, curiosity about electronic hardware and circuit boards came to me. The Shoe Collection consists of ten pairs of shoes, and was divided into two categories of study: infrared emitter circuits and gear movement. The design of each pair was inspired their own special functions, such as high heels that will never fall down from any high surface and boots that have little sneaky monster dolls inside.